Our STANDARD PLATFORM is used to support all mattress types and sizes. It attaches directly to the Underbed Dresser and replaces the box spring. A platform is generally (but not always) used with a 12 drawer Underbed Dresser to reduce bed height. The platform corners are trimmed and the edges are smooth (taped). The platform is made of strandboard (OSB) or plywood. 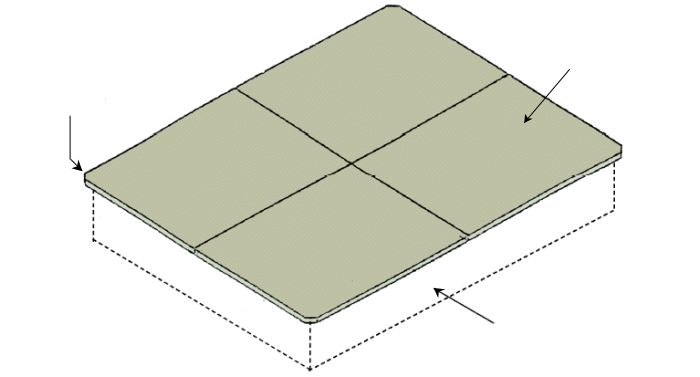 Platforms are cut slightly smaller than mattress dimensions to hide platform edges. Platform is not necessary when using a box spring. NOTE: If you are ordering our bookshelf headboard or bedside tables, you must order our Deluxe Platform (C2). If you are ordering our Pure Health® Mattress, you must order platform C1 or C2. We recommend platform C2 (Shown below) for our mattress. Forms the top of the underbed dresser and supports and holds your mattress in place. It eliminates the useless, money wasting, space-wasting box spring. The platform edges prevent the mattress from bowing out at the sides and from moving on the platform. Our Mattress Platform (C2) fits on top of the Bedroom Organizer™ underbed dresser. It supports our Mattress, Headboards, and Bedside Tables. It can also be used to support other mattresses. The platform is made of four plywood or strandboard panels (your choice). The edges are made of clear aspen or oak hardwood, which is hand sanded and beautifully stained to match the underbed dresser (Also available ready to finish). Your bed spread can hang over the platform edge, or it can be tucked under the mattress so that the finished platform edges show See photo. It is shipped unassembled and is easily assembled with a battery screwdriver. All hardware is included. NOTE: Platform is not necessary when using a box spring.